Less than 30 days to go until the start of Football season and I’m pulling out all my best tailgating and football party food recipes. This idea for Mini Burgers is sure to please your tailgating buddies or anyone you have over for a football viewing party. It is also great as a quick burger meal on those nights when you need something fast! The burger patties can be cooked ahead of time, frozen, and then reheated to make this a great on the go meal! We start off by mixing our ground beef with one envelope of Lipton Onion Soup Mix. 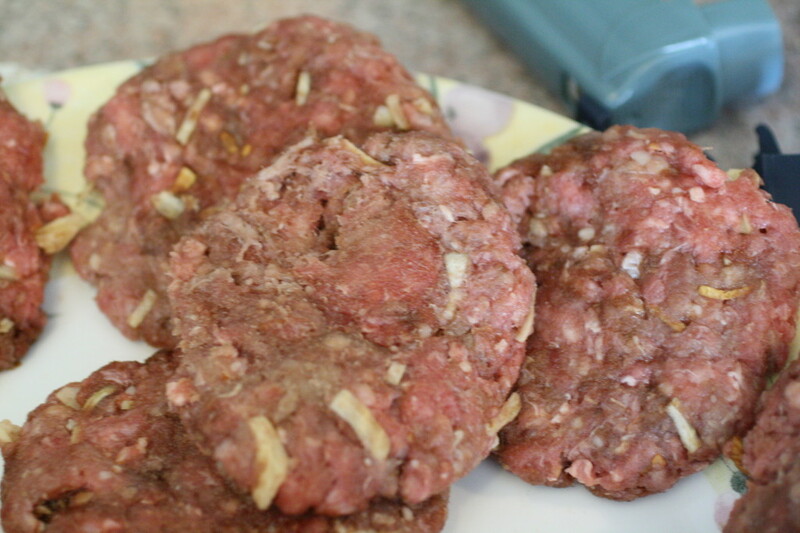 1 lb of ground beef will give you approximately 11 to 12 mini burgers. Mix until the onion soup mix is incorporated well. Pat out your burgers, make them a little bit bigger than the bun. Take your package of Kings Hawaiian Rolls, leave them in the cardboard and with a sharp knife, slice all of them horizontally. Remove the rolls, wrap in foil, and place in the oven that is heated to 300˚ for the to warm up. 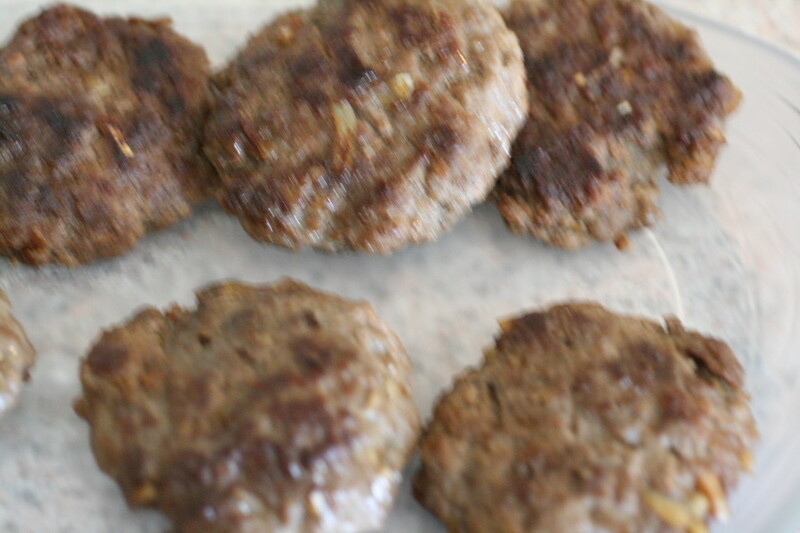 Take your burger patties and you can either grill them or cook them in a skillet on the stove. Make sure to cook until cooked through. Drain on a paper towel. After I drain mine on a paper towel, I take a slice of American Cheese and 1/4 it, placing each 1/4 on a burger and let it melt while I’m fixing the others. You could also pop it into the microwave for about 5 seconds to gently melt it. Remove the rolls from the oven and assemble the burgers! Burger Toppings of your choice! 1. Mix the ground beef with one package of Lipton Onion Soup Mix. 2. Pat out the burgers so they are thin and just a tad bigger than the roll. 3. Take the Kings Hawaiian Rolls and remove from the package. While still in the cardboard, take a sharp knife and slice horizontally all the way across the rolls. Remove, wrap in foil, and place in a 300˚ oven to warm up. 4. 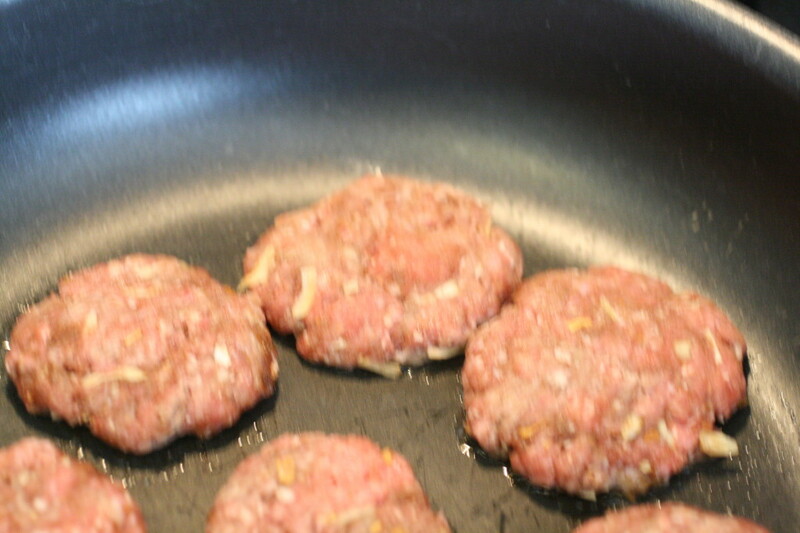 Grill or prepare on the stove the patties until they are cooked through. Drain on a paper towel. 5. Assemble your mini burgers! You can create a topping bar and have everyone go through and put their favorite toppings on the burger such as a pickle, ketchup, mustard, BBQ sauce, etc. Would love for you to link this to Friday Favorites at my party going on now! I can’t believe it’s almost football season! Visiting from Bloggers Brag…happy to be pinning these babies. 🙂 Great idea using the Hawaiian rolls. I’ve never heard of putting onion soup mix in burgers. It sounds like it would add the perfect amount of flavor.